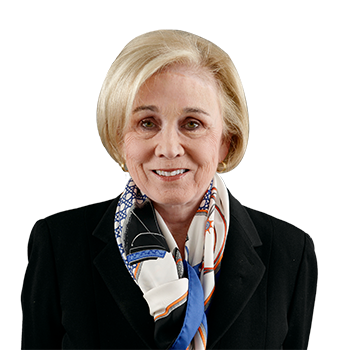 A dedicated and outstanding leader in the Washington, DC real estate community, Ellen Morrell is truly extraordinary. Not only is she one of the first women to graduate from the McDonough School of Business, a revered Georgetown Marketing professor, and a 2009 recipient of the prestigious John Carroll award, but over the last thirty years Ellen has built a tremendously successful real estate business. Her success can be attributed to her meticulous attention to detail, wholehearted passion for the industry, and willingness to go the extra mile for each and every one of her clients. It is no coincidence that for over ten years, Ellen and her partner Ben Roth, have been highlighted by the Wall Street Journal as one of the top 250 residential real estate teams in the country. In 1999, Ellen joined Washington Fine Properties as an Associate Broker. Ellen has an established reputation for innovative sales techniques, proven marketing strategies, and an intimate knowledge of Northwest, DC. Always a pleasure to work with, Ellen relishes the opportunity to work with everyone from Ambassadors to novice first-time buyers. She works on a very personal level with her client sellers to help them prepare their homes for presentation to the buyer/broker marketplace. She organizes every aspect of these houses so that they are ready for center stage. She takes great pride in her long established record of selling her listings soon after their listing date. She also works methodically with her client buyers to find them every available house, whether or not listed. In the end, Ellen makes sure that her client buyers find their ideal home, filling each requirement. Ellen can be described as graceful, poised and professional, but also fierce and unrelenting when it comes to negotiating on her clients behalf. Before Ellen found residential real estate, she co-founded the business program at Marymount College in Virginia and at Mount Vernon College, where she also chaired its business faculty. After earning her master�s in education at Virginia Tech, Ellen returned to Georgetown. During her tenure, she served as assistant to the dean of the business school where she helped establish Georgetown�s MBA program and began the Executive-in-Residence Program that brings industry leaders to campus. In 1994, Ellen received the William Gaston Alumni Award for her service and leadership. Most importantly, during this time, she served the marketing department as a professor where she was deeply loved by her students and colleagues, by whom she is celebrated to this day, a true testament to her character. Ellen�s previous experience as a marketing professor is put to good use as she positions her clients� properties in the marketplace through highly creative and proven programs.